Berit's artful New Orleans haul. Photo: Berit Baugher. It's Wednesday, and that's Travel Loot day. 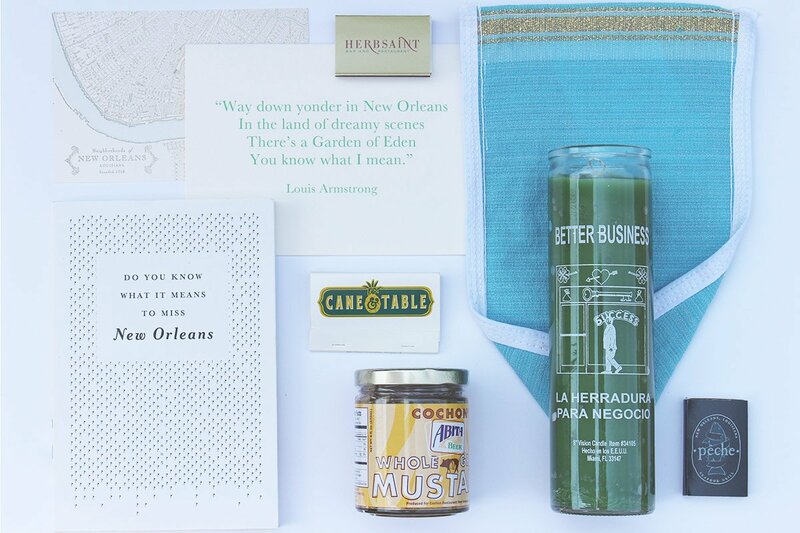 Today Gentedimontagna's Berit Baugher unpacks her favorite finds from NOLA. NEW ORLEANS – When you get a chance to visit New Orleans, you go. And go. And go. And go. As I write this, I'm returning from my fourth trip this year. While I'm happy to be home in New York City, I'm already feeling nostalgic for my time in the Big Easy. The crumbling sidewalks and gardenia-filled air get under your skin — and stay there. As with any good trip, my suitcase was always a little bit heavier on every trip home. Here are a few of my favorite finds that made their way back North with me. Despite being a full Kindle convert, I love visiting bookstores to browse, to judge books by their covers, and to pick up local guides and small-run novels. I came across at one of my favorite Uptown shops, . A compilation of essays and art written after Hurricane Katrina, it seemed like the perfect book for someone who was about to literally be missing New Orleans. Turkish textiles have very little to do with the city other then the fact that the owners of had an incredible idea: Move to Turkey, source textiles, and sell them in New Orleans. A pretty good concept if you ask me. I walked the full length of Magazine Street not once but twice, so their will come in handy as I try to recondition my poor feet. I also snagged a few for summer birthday presents. Some people are into food, others are into sports. Me, I'm really into stationery. Show me a cute card or a nicely designed notepad, and I'll be happy for hours. Always on the hunt for the best paper goods, I didn't come home disappointed. Fifteen cards and two notepads snuck their way into my suitcase. For her eponymous shop, made a nice series of New Orleans-inspired quote cards that are a better alternative to cheesy tourist postcards. and are two other good spots for replenishing your stationery supply. You can't visit America's most haunted city without a little Louisiana voodoo. On the , I stopped by in the Bywater for a to bring good luck to our office. Now I just need to find the vile of dragon's blood they recommended for extra potency. Back when I was a New Orleans newbie, I had no idea how food-focused the city is. With their great love of all things edible comes an endless supply of food products. Packets of seasoning to recreate or , and to channel , and bags upon bags of Zapp's kettle chips (the is my all-time favorite). You could easily stuff a suitcase full of food and eat New Orleans-style until your next visit. After careful consideration, it was a jar of flavored with local brew, Abita Beer, that came home with me.